Hugs to you all for the lovely comments you gave me on the last post. I really do appreciate them. The Halloween SAL is going well. I finished my first bit! Excuse the photo..it is stitched on Wichelt Hand Dyed 'Sand Castle' with Belle Soire 'Black Crow' and a lovely purple from Nancy over at the Victorian Sampler Shoppe, Heather. October is finished. So very pretty! 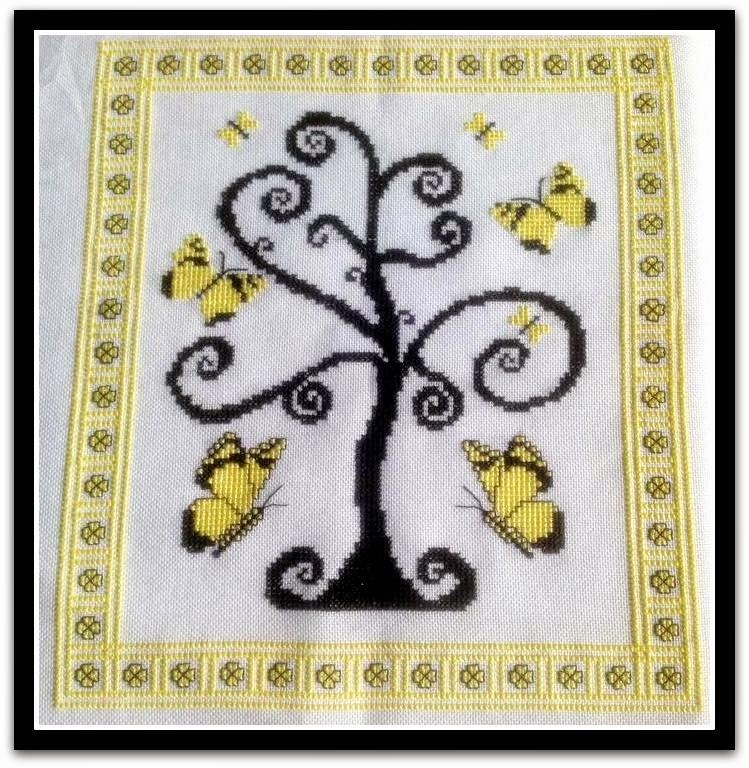 And a wonderful lady called Ronnie Hancock adapted my Dance of the Butterflieschart and stitched it in yellow...isnt it beautiful. I like it so much I'm going to release it! Thank you Ronnie! My daughter finally got a hospital appointment for her diabetes management and guess what? They changed computer systems and she got marked as 'void'. Not sure if that means dead or not needing treatment, she didn't like to ask. The nurse who has taken her case on went out and shouted at a lot of people. My daughter said the nurse reminded her of me! This new, wonderful nurse has now been put my daughter down for appointments with the dietician, and she's been put forwards for a special course which means she may be able to use a pump. Her night time insuline was way too high which is why she kept having hypos, and even better, the nurse gave my daughter a direct telephone number in case she needs help. Finally. I seem to have lost my last child for the weekend so I'll be busy working out new design software and sewing. I'm off till Monday!!!! Yippee!!! I love the butterfly chart! It's so pretty! I am sending positive thoughts your way. My family suffers from Diabetes and I understand how hard that journey is. Keep your head up! Oh that is so good to have the nurse on her side working for her. Now hopefully things will get in order and under control. 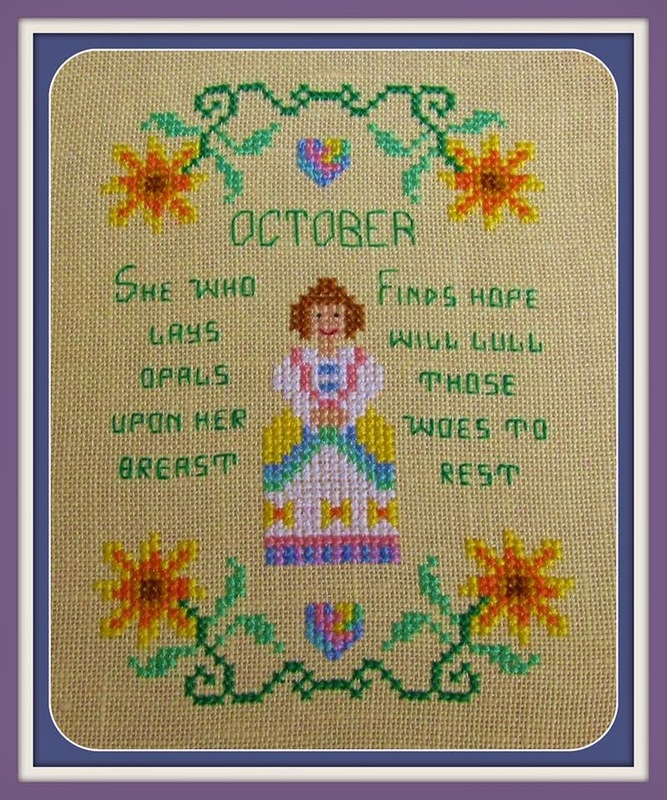 You are in my prayers my dear..
Gorgeous stitching! I really like the yellow, very pretty and very summery. Gorgeous stitching. The butterfly piece is just so pretty. I do hope that everything gets sorted for your daughter. Lovely finish and Halloween stitching. Very pretty butterfly finish, it's fantastic!! Butterflys in yellow looks so pretty. Greta news help at last from someone who seems to care about her patients .... hope your DD soon gets sorted and can live her life happily. The butterfly piece is so pretty! And I'm so pleased to hear that your daughter is getting the proper care and attention. Enjoy the rest of your week!